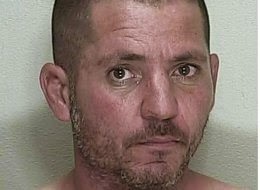 Daniel Trent, 38, of Ocala, Florida, recently stabbed 56-year-old, Mark Durham to death over the last can of beer the two purchased together. A Florida man accused of stabbing his friend says he did it because the victim wouldn't split the last can of beer. “He didn’t want to share it. He wanted it for himself,” Daniel Trent said during a jailhouse interview with the Ocala Star-Banner. Trent, 38, was arrested Monday and charged with second-degree murder in the death of Mark Durham, 56. The stabbing occurred at Trent’s home in Ocala, Florida, after the two had polished off a 24-pack of Natural Ice followed by 17 beers of an 18-pack they purchased together. Trent says Durham grabbed that last beer first, which provoked an argument. Durham then grabbed a small knife from the kitchen and cut the side of Trent's index finger. Trent eventually grabbed the knife from Durham and stabbed him twice -- once in the stomach and once in the chest. “I felt this was self defense because he attacked me,” Trent told the paper. According to WESH, before he died, Durham asked Trent to stab his pet beagle. The dog died as a result. Trent was still at the scene when investigators arrived. Police said he admitted to the stabbings. Trent's next door neighbor Geralyn Anderson tells WCJB-TV that Trent moved into the neighborhood about six months ago, and made a strange first impression. "He just acted really strange, was overly friendly and drank a lot," she said.